Recently I lost one of the best friends I’ve ever had. And I know I’m among many people who can say the same thing. Pattie Noel, my metastatic breast cancer sister, drew her last breath around 8 p.m. on July 22, just a month shy of her of 50th birthday. She was surrounded by loving family and friends, and I thank God I was one of them. I knew Pattie from Pink Ribbon Girls, an organization dedicated to helping breast cancer survivors, young women in particular. We were friends, but developed a strong bond when we were diagnosed with stage IV breast cancer one month apart. We seemed a kind of an odd couple. She was an extremely faith-filled Christian who never said an unkind word about anyone. As her husband said yesterday to us, she loved everyone. I never met anyone as selfless as her. As she approached death, her sister told me her biggest disappointment was that she was not going to be able to help more people. In contrast, I’m a non-practicing Jew, prone to swearing at times and getting angry over situations I deem unfair. I have spent most of my adulthood trying to be less selfless and learning to take care of myself. I’ve been in years of therapy trying to reduce my codependency I learned from having a drug-addicted mother and bi-polar father and brother. I consider myself more spiritual than religious and am definitely not a Bible reader. Since being diagnosed with metastatic disease, my passion has been for helping other stage IV survivors. But I tended to stay away from meetings for newly diagnosed, early-stage survivors, thinking they would be afraid of my story and diagnosis. 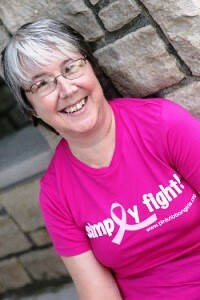 Pattie never felt uncomfortable and had an affinity for helping women who are overwhelmed by a cancer diagnosis. She had a gentle spirit and was a good listener, which helped make members feel comfortable sharing their experiences and emotions. And she was willing to share her personal experience with anyone. Pattie was always emailing new members and had a wonderful, calming presence to ease fears. Pattie did all of her good works without expectation of any recognition. At a workshop on forgiveness Pattie helped organize, I joked with her that I couldn’t picture her holding a resentment because she was so angelic. I always felt like Pattie was an angel on earth. Now she is an angel in heaven. And I believe she is up there right now, looking down on all of us, helping us along the way. Yesterday, as I sat on the porch of her lovely home with my friend Banita, the most unusual thing happened. A moth with monarch butterfly-like markings was fluttering around me. It landed on my leg and sat there for a long time and even hung out on the ground right by my chair. A similar butterfly landed on my back and was fluttering around me the day before when Mike and I were canoeing. I believe that was Pattie’s spirit hovering around, giving me reassurance that she was there for me and that her love will never go away. We, indeed, have an angel watching over us, and her name is Pattie Noel.